Franklin's Gull adult in ploughed field opposite fishermans car park 16-15.......Birdguides. Hobby x 3 over village this afternoon............Birdguides..
also.....Garganey , Common Scoter , 2 Black-tailed Godwit , Knot...........E Clare. 3 x Little Egret , Redstart , 5 x Common Sand , 3 x Curlew , 16 LRP , 5 x Green Sand . 4 xOystercatcher , Yellow Wagtail ................A Barker , R Powell. Garganey one in Tad Bay also 1st summer Med Gull........Birdguides. Common Scoter drake still on Boundary Flash.............Birdguides. Little Gull x 6 on the mere this afternoon..................Birdguides. immature Peregrine flew through this afternoon.............BB. Franklin's Gull adult again from sailing club this evening...........Birdguides. Y L Gull juvenile today.............Birdguides. Greenshank , 3 x Dunlin and Little Egret in Tad Bay this evening. Arctic Tern still present also female Garganey and fly through Sanderling...Birdguides. Cattle Egret again mid-evening from hide............Birdguides. Common Scoter drake on large pool late evening.......Birdguides. 2 x Common Sand early morning only.........C Waring. Hobby over @ 18-30............D Powell. Med Gull adult briefly this morning at 9-45. 2 x Arctic Tern mid-afternoon.......R Sutton. Turnstone x 3 on south shore this afternoon........Birdguides. Dunlin , 3 x Common Sandpiper , 3 x Yellow Wagtail. Sanderling , 2 x Common Sandpiper.............A Barker. 1 x Green Sand , 3 x Common Sand , 10 x LRP , 12 x Yellow Wagtail.......A Barker. Y L Gull adult also Hobby this evening............A Barker. 17 x Common Tern , Little Egret and Hobby................BB. Y L Gull adult on sailing lake this evening........Birdguides. Arctic Tern x 11 present this morning also Little Egret....Birdguides. Knot x 5 in Tad Bay also Little Stint and Sanderling...........Birdguides. Arctic Tern x 5 this evening also 2 x adult Y L Gulls..........Birdguides. Cattle Egret flew from Grey Heron roost @ 5-30 this morning....Birdguides. Cattle Egret came into roost this evening for its 2nd day..........Birdguides. Common Sandpiper early morning...........C Waring. Med Gull adult briefly then flew west @ 11-30.......Birdguides. Common Sandpiper also Hobby over @ 13-45.......SS. 3 x Common Sandpiper , Y L Gull adult , Peregrine . Common Sandpiper , 2 x Black-tailed Godwit .................R Swift. Whinchat this morning also Redstart and Hobby........Birdguides. Quail still calling along rough track.........Birdguides. @ 17-30 , No further sign by mid-evening , Whimbrel over @ 19-25. 10 x Common Sand , 7 x LR Plover............BB. Curlew x 8 ..................A Barker. 3 x Little Egrets flew east @ 20-10.........R Powell. Shelduck juv , Y L Gull juv , Oystercatcher and Peregrine.....A Barker. Adult Yellow legged Gull on sailing lake this afternoon....Birdguides. Green Sand x 2 on flash also Peregrine over.........Birdguides. Sanderling still present also Greenshank.........Birdguides. adult Y L Gull , 2 x Yellow Wagtail. 3 x Little Egret , 8 x Goosander , 8 x Egyption Goose , 16 x Common Tern . 2 x Oysterctcher , 16 x Common Sandpiper , 8 x Shelduck........R Berry. Ruddy Shelduck adult early morning..........N Smith. Little Egret x 3 juv, also 2 x adult Y L Gulls and 8 x Green Sand.....Birdguides. Common Tern early morning briefly........N Smith. Y L Gull x 2 (1 adult 1 juv), LR Plover x 2 , Peregrine........A Barker. Black-tailed Godwit x 10 mid-afternoon also Greenshank.......Birdguides. 13 x Crossbill over towards Burslem @ 6-30.......N Smith. Franklin's Gull still present at dusk also 5 x Y L Gull........Birdguides. Green Sand x 2 on flash today.......Birdguides. Sanderling this afternoon also Turnstone and Little Egret.....Birdguides. Quail still by sharp bend along rough track............Birdguides. Redstart this morning also 2 x Green Sands....WMB. 4 x Common Sandpiper , 3 x Oystercatcher , Turnstone.........R Berry. Common Tern briefly at 9-45 on main lake. 4 x Curlew , 45 x LR Plover and a Shelduck this evening...A Barker. 5 x Yellow-legged Gulls and Med Gull.......Birdguides. Little Gull 1st summer still viewed from canal tow path........Birdguides. Quail x 2 still calling from bend along rough track...........Birdguides. Sand , 25 x Common Sand , 13 x LR Plover , and a Little Egret ........BB. 4 x Raven over heading north east 9-45.....SS. Yellow-legged Gull adult this evening.........A Barker. Franklin's Gull adult again mid-evening...........Birdguides. Arctic Tern 1st summer still also Turnstone and Greenshank....Birdguides. Field will be harvested tonight.!!!!!!!!!!!..........Birdguides. Franklin's Gull present mid-morning viewed from south shore. No further sign at 13-00 but 4 x Yellow legged Gulls....Birdguides. 20 x Common Tern and Hobby...............BB. Greenshank , Ringed Plover , Dunlin , Snipe , 7 x LRP , 9 x Common Tern . Oystercatcher , 2 x Common Tern ................R Powell. Yellow-legged Gull adult also (juv) Little Egret, fem Mandarin....Birdguides. 3 x Common Sand's............N Smith. Mandarin on main lake at 6-40 before flying off north...N Smith , C Waring. Arctic Tern first summer still also 2 x Little Egret...........Birdguides. Med Gull and 2 x Yellow-legged Gulls..........Birdguides. Greenshank , 5 x Redshank , Pintail (unseasonal).......N Smith. Little Egret , 4 x Dunlin , 4 x Redshank , Goosander.........N Smith. Franklins Gull adult again late afternoon viewable from sailing club. Still present this evening but distant. 42 x Black-tailed Godwit flew low south early afternoon.....Birdguides. Black-tailed Godwit x 5 today ..........Birdguides. Arctic Tern first summer today.........Birdguides. Red Kite over Weston Village along A51 mid-morning........Birdguides. 15 x Common Sands , 3 x Dunlin , 25 x LR Plover , 2 x Little Egret ..BB. and 3 x Green Sands...........Birdguides. 7 x Green Sandpipers late morning.........Birdguides. 1 x Wood Sandpiper , 14 x Oystercatcher , 5 x Curlew.....R Powell. 2 x Quail still calling by bend along rough track. 6 x Black-tailed Godwit in Blythe Bay and Greenshank Tad Bay. 10 x Common Sand , 8 x Common Tern , 2 x Raven over.....E Clare. 2 x Redstart , 1 x Pied Flycatcher...........R Toon. 13 x Common Sandpiper , 27 x L R Plover , 22 x Common Tern .....BB. 19 x L R Plover , 8 x Oystercatcher , Little Egret (juv).........A Barker. Little Egret briefly before flying off east..........NP. 10 x Crossbill at Parkhouse end.........R Sutton. Common Tern x 2 on main lake @ 8-15........N Smith. Little Gull (1st sum) still present this afternoon also Garganey....J Allen. LRP x 25 , and Common Tern x 1 ............A Barker. This afternoon, Hobby , Little Egret and Common Sand.....R Powell. LRP x 25 , Common Sand x 22..........BB. Quail one possibly two along rough track by bend still.........Birdguides. Common Scoter (female) still this afternoon........Birdguides. Common Sand x 2 , YellowWagtail x 2 (juv), Common Gull ...........A Barker. Common Sand and female Goosander with 2 youngsters.....P Shenton. 5 x Common Sand............R Berry. 24 x LRP , 5 x Oystercatcher , 2 x Common Tern.......R Powell , A Barker. 5 x Woodlarks by army camp , also 2 x Nighjars .............R Eyres. Little Gull (1st sum) ...TVB. 2 x Quail still calling along rough track by sharp bend.........Birdguides. Crossbill x 40 this morning.........NP. 4 x Common Tern .............S Petrek. 2 x Quail calling in barley field @ SK17118 from bend in track......Birdguides. Common Sand x 2 , Curlew x 4..........A Barker. LR Plover x 2 early morning only.........C Waring. also Common Tern at 10-15. Quail still calling in barley field at SK17118 from bend in road....Birdguides. Red Kite over this morning........B Low. A report of a B N Grebe at @ 15-00 but no sign since. Little Tern x 2 in Tad Bay @ 12-45.........Birdguides. Ringed Plover x 2 , Little Egret , Common Tern x 6.....R Powell. Quail still singing today by sharp bend along rough track.......AR. L R Plover x 20 , Green Sand , and 8x Common Sand.......BB. Little Egret on west side @ 14-20. Black-tailed Godwit yesterday at Smallthorne taken by C Gater. Crossbill x 10 also Tree Pipit. and Oystercatcher x 4 this evening..............R Powell. Common Tern x 8..............E Clare. 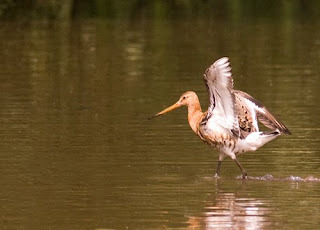 Black-tailed Godwit on lake behind Ford Green Hall.